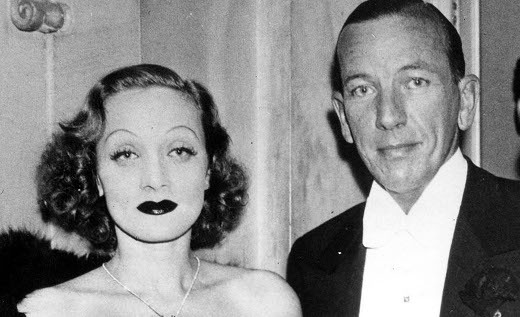 Here's some sound, stern relationship advice from the great Noël Coward, in the form of an invaluable letter he sent to his good friend, Marlene Dietrich, in 1956. He was replying to a recent, downbeat missive from Dietrich, in which she had detailed the latest in a long line of depressing "episodes" involving her on-off lover of a few years, Yul "Curly" Brynner. Coward clearly couldn't bear to see her suffer any longer. Your letter filled me with such a lot of emotions, the predominant one being rage that you should allow yourself to be so humiliated and made so unhappy by a situation that really isn't worthy of you. I loathe to think of you apologizing and begging forgiveness and humbling yourself. I don't care if you did behave badly for a brief moment, considering all the devotion and loving you have given out during the last five years, you had a perfect right to. The only mistake was not to have behaved a great deal worse a long time ago. The aeroplane journey sounds a nightmare to me. It is difficult for me to wag my finger at you from so very far away particularly as my heart aches for you but really darling you must pack up this nonsensical situation once and for all. It is really beneath your dignity, not your dignity as a famous artist and a glamourous star, but your dignity as a human, only too human, being. Curly is attractive, beguiling, tender and fascinating, but he is not the only man in the world who merits those delightful adjectives...Do please try to work out for yourself a little personal philosophy and DO NOT, repeat DO NOT be so bloody vulnerable. To hell with God damned "L'Amour." It always causes far more trouble than it is worth. Don't run after it. Don't court it. Keep it waiting off stage until you're good and ready for it and even then treat it with the suspicious disdain that it deserves...I am sick to death of you waiting about in empty houses and apartments with your ears strained for the telephone to ring. Snap out of it, girl! A very brilliant writer once said (could it have been me?) "Life is for the living." Well that is all it is for, and living DOES NOT consist of staring in at other people's windows and waiting for crumbs to be thrown to you. You've carried on this hole in corner, overcharged, romantic, unrealistic nonsense long enough. Unpack your sense of humor, and get on with living and ENJOY IT. Incidentally, there is one fairly strong-minded type who will never let you down and who loves you very much indeed. Just try to guess who it is. XXXX. Those are not romantic kisses. They are un-romantic. Loving "Goose-Es." Your devoted "Fernando de Lamas"